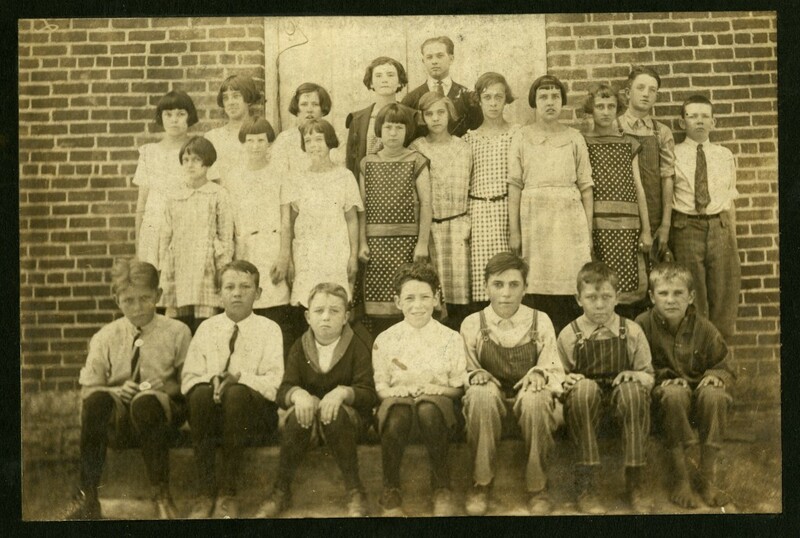 Sugar Grove School, Henry County, Indiana, 1923. Don’t they look thrilled to be going back to school? As students across Indiana return to school, the Genealogy Division would like to highlight an often-overlooked genealogical resource: school enumeration records. Although an individual student’s records are protected by privacy laws, school enumerations functioned as a type of census and are therefore not private. School enumerations were created by local governments to document the number of school-aged students. Enumerators went from house to house, inquiring about the number of students in each household. Unlike the federal census, these enumerations took place every year in most areas. The typical school enumeration record includes the geographic area covered by the enumerator, the names of the heads of households, and the names, ages, and genders of the children in each household. Some enumerations can contain more information. Usually, households without children were not enumerated. Transcription of a school enumeration record from Harrison County, Indiana, taken in 1846. These records are a useful source for genealogy researchers because they cover time periods that are not always well-documented by other records. 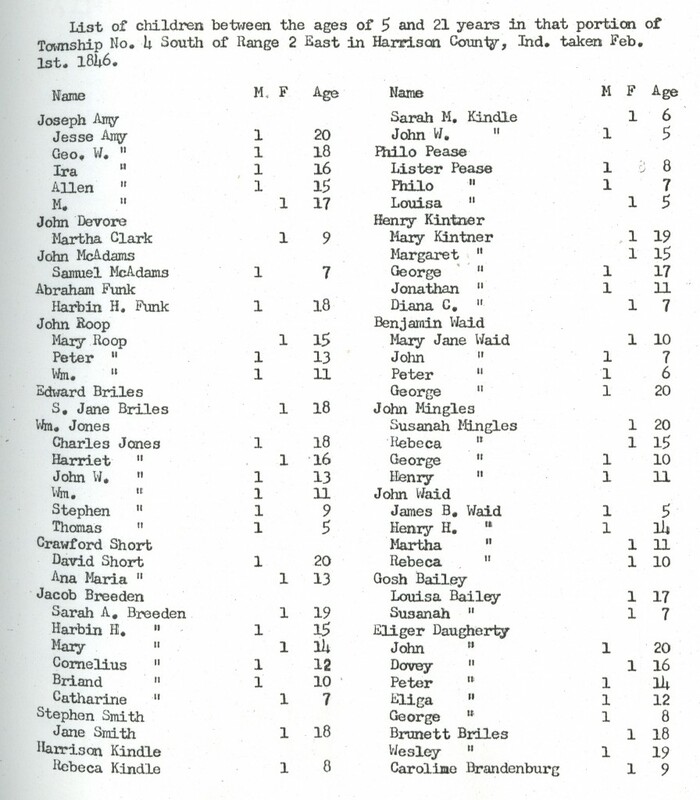 Because school enumerations were conducted more frequently than the censuses, these records can document when ancestors moved from one place to another and also provide the names of children who may have been born after one census and died before the next census. Also, if a county conducted a school enumeration in the late 1880s or early 1890s, the records can be used as a replacement for the 1890 Census, which was destroyed by water damage resulting from a fire. Finally, since Indiana did not have birth certificates until 1882, and such records were not mandatory until 1907, school enumerations can be used to help establish parent-child relationships. 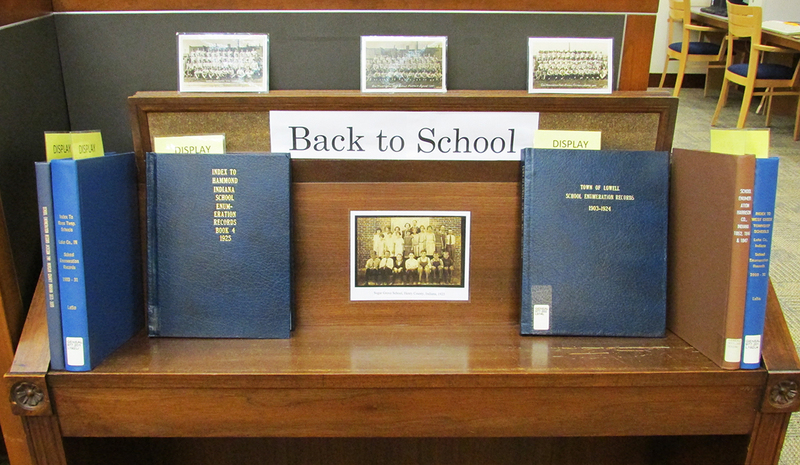 The Genealogy Division currently has a display featuring school enumeration records from around the state. Our books containing these records may be found in our online catalog. We also have some school enumerations on microfilm in the genealogy section of the microfilm collection. This entry was posted in Genealogy and tagged Elementary, Genealogy, Harrison County, Indiana, Indiana State Library, School, Sugar Grove School by indianastatelibrary. Bookmark the permalink.